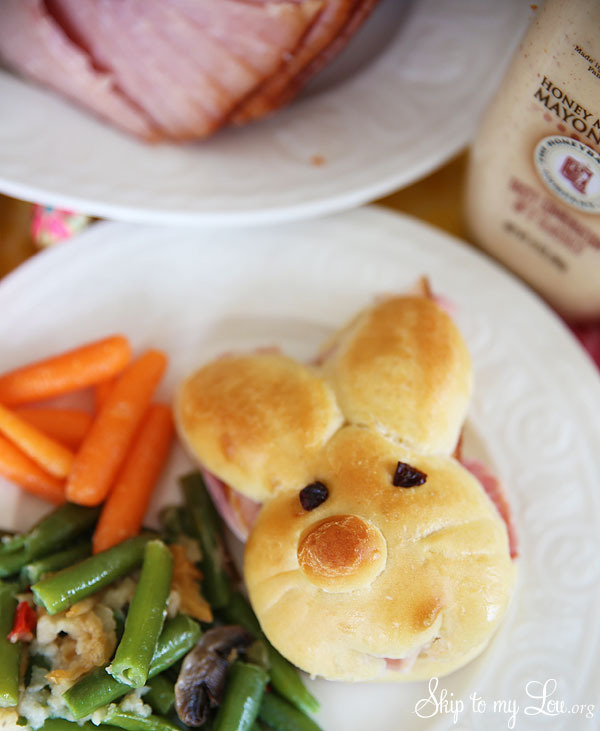 Bunny Rolls will make your Easter dinner extra special. They are great with just a pat of melted butter, yum! 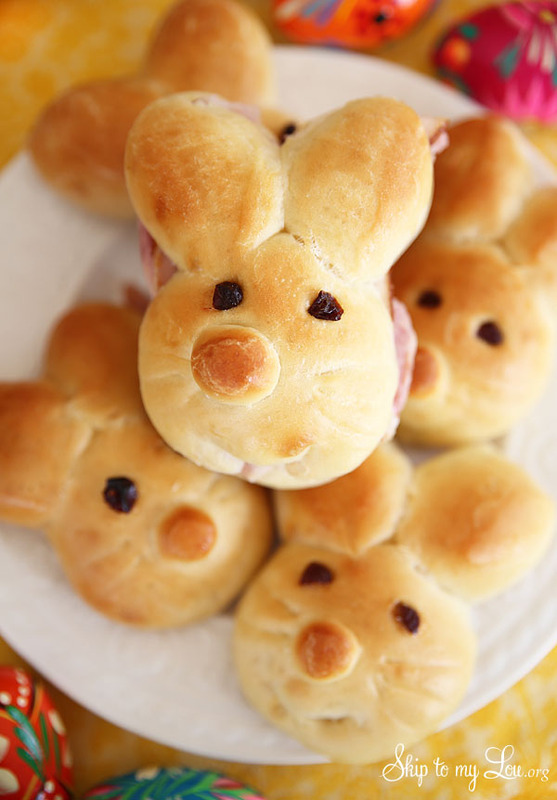 Or if you’re looking for more casual Easter dinner ideas, slice these little bunny bread rolls open for the cutest sandwiches ever! First, let’s make some dough. I use this bread dough recipe. Trust me, you will love this dinner roll recipe! 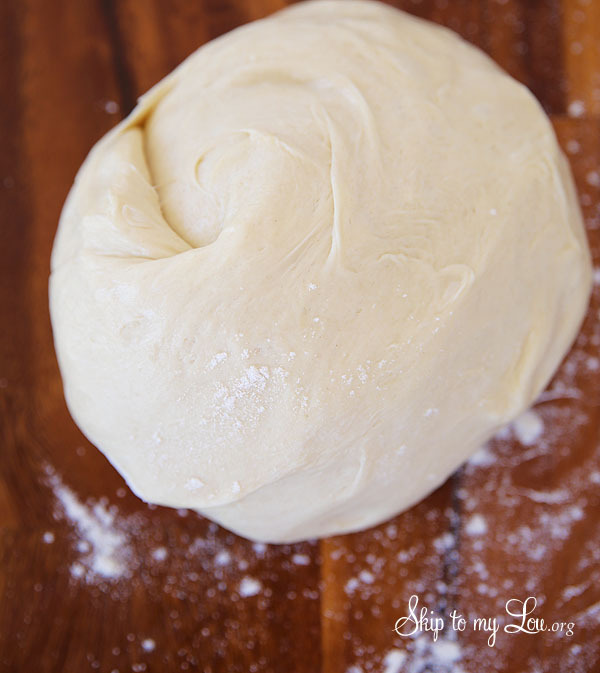 It really makes the most versatile yeast dough – I use it for dinner rolls, cinnamon rolls and, of course, it is perfect for Easter bunny rolls. First, combine yeast, warm water, and sugar. Let stand for five minutes. Next, combine yeast mixture, butter, egg, salt, and half the flour: beat with mixer or food processor just until mixed and smooth. Gradually add in flour to make a soft dough. I use a food processor with the dough blade and mix for 45 seconds or mixer with the dough attachment for 2 minutes until a soft ball is formed. Place dough in a well-oiled bowl, and turn to grease the top of dough. Cover in a warm area for about an hour until dough rises and almost doubles in size. At this point, you can also put the dough in an oiled zip-lock bag and keep in the refrigerator for up to four days. I put the dough in the refrigerator because I like to roll dough out while it is cold. If not refrigerating, punch dough down, turn out onto a lightly floured surface, and kneed a couple of times. I use a 1 1/2 tablespoon scoop to portion out the dough. Each bunny-shaped roll takes two dough balls. 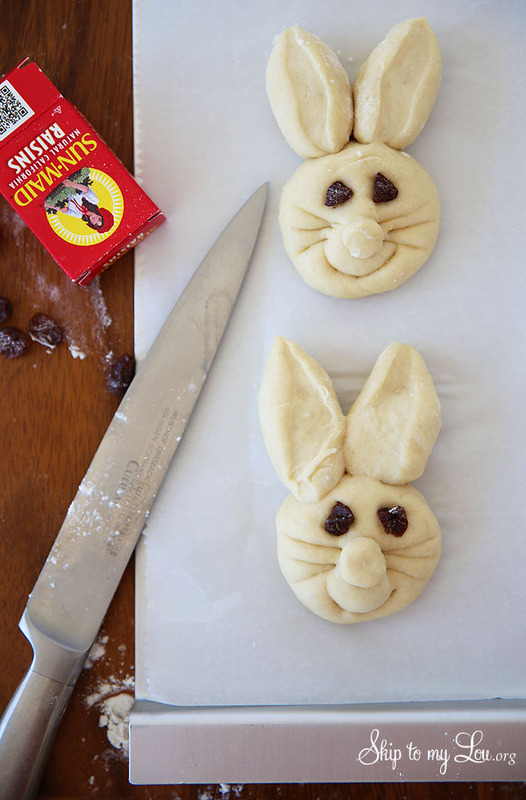 This recipe will make about 1 dozen bunny rolls. 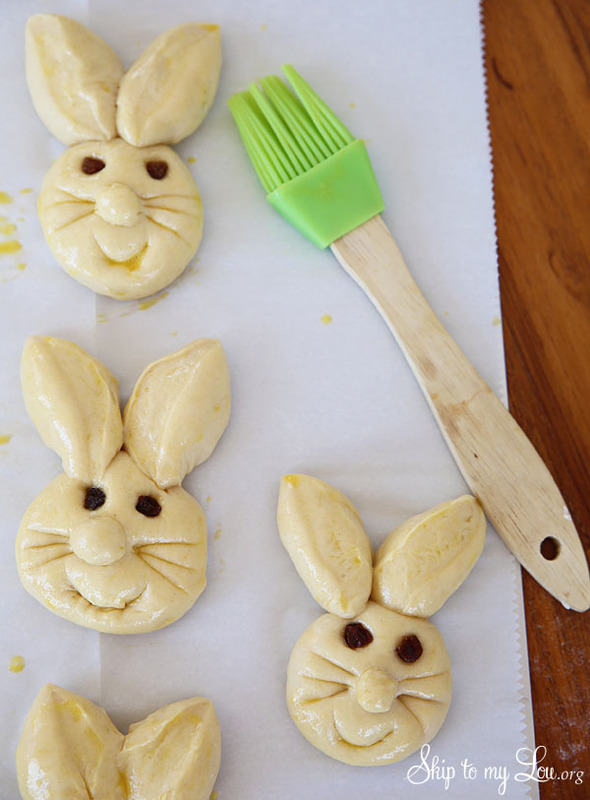 Take one of the dough balls and tear off a pea-sized piece for the bunny nose. Cut the rest of the dough ball in half. 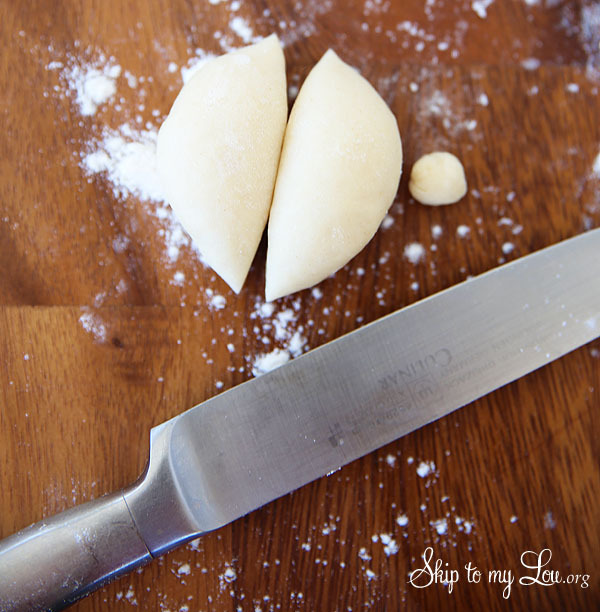 Place the cut halves (cut side up) at the top of the second dough ball on your baking sheet. Place the small piece of dough in the middle of the large ball for the nose. Now cut a raisin in half and push it into the dough for eyes. Next, take a sharp knife and cut into the dough to make whiskers and a mouth. Each cute bunny has its own personality! Beat 1 egg with about 1 tablespoon of water to make an egg wash. Use this to lightly and evenly paint onto the bread dough. When you’re done, loosely cover the bunnies with a piece of plastic wrap sprayed well with cookie spray. Allow to rise for about 30-40 mins. If the dough was cold, they might need to rise about an hour. They should get puffy. Before baking, push in any eyes that might have popped out during rising. Slits can also be made more prominent with a well-oiled knife (dough will be sticky). Bake at 400 degrees for about 10 minutes, or until golden brown. Here is a video so you can see how easy they are to make! Below is the printable bunny dinner roll recipe. I hope you love making bunny rolls! They make fantastic side dishes, and perfect slider buns for leftover glazed ham or roast chicken. Enjoy! Combine yeast, warm water, and sugar. Let stand five minutes. Combine yeast mixture, butter, egg, salt, and half the flour: beat with mixer or food processor just until mixed and smooth. Gradually add in flour to make a soft dough. I use a food processor with the dough blade and mix for 45 seconds or mixer with the dough attachment for 2 minutes until a soft ball is formed. Place dough in a well-oiled bowl, turn to grease the top of dough. Cover in a warm area for about an hour until dough rises and almost doubles in size. You can also at this point put the dough in an oiled zip-lock bag and keep in the refrigerator for up to four days. I put the dough in the refrigerator because I like to roll dough out while it is cold. If not refrigerating, punch dough down, turn out onto a floured surface, and kneed a couple of times. 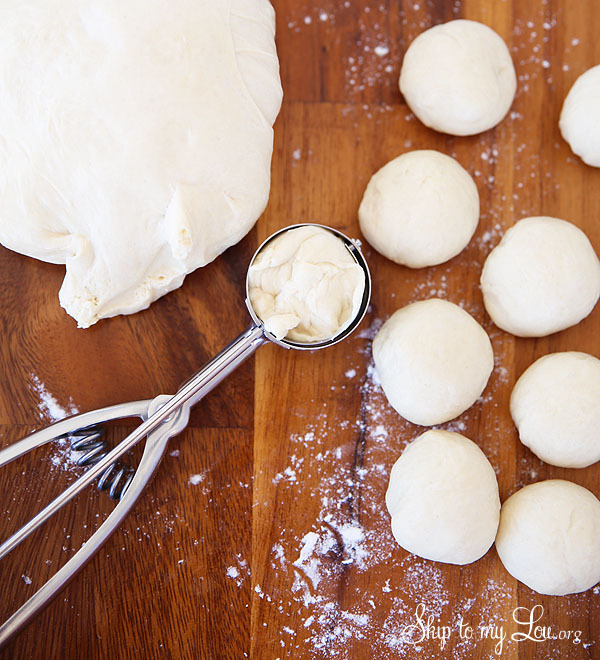 Shape dough into rolls. Allow to rise for about 30-40 mins. If the dough was cold they might need to rise about an hour. They should get puffy. Bake at 400 degrees for about 10 mins or until golden brown. For more bread recipes, try my no-knead bread or my bread-in-a-bag recipe – it’s perfect to make with kids. Planning the perfect Easter dinner get-together? Don’t forget a few activities to make the day extra special for guests. Try these super simple bird nest favors to spruce up your holiday table. They’re so cute sitting on each plate to welcome guests. Keep the conversation flowing with these dinner conversation starters. Placing the questions in plastic eggs makes them a festive and fun way to avoid awkward silence! Don’t forget the kids! They will enjoy these Easter Coloring pages as a fun activity right at the “kid’s table” And these cute bunny bags make great Easter basket stuffers and take-home party favors. 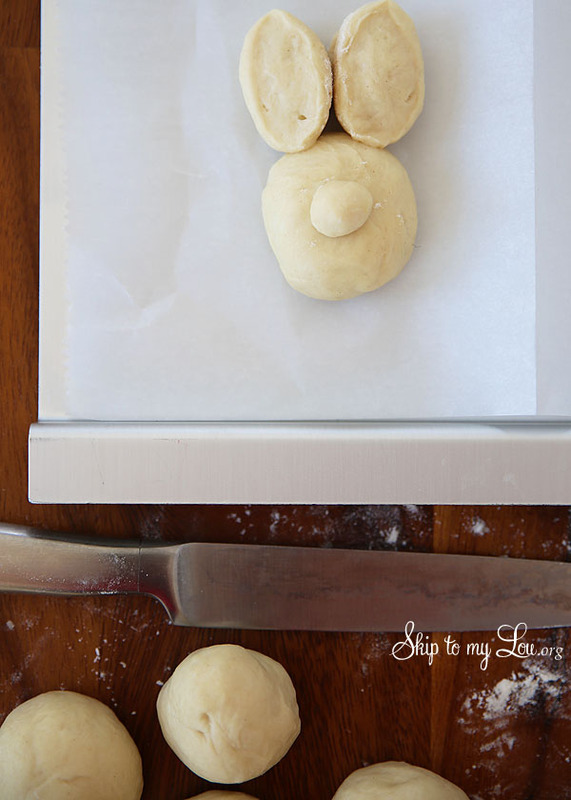 Do you have printable directions for forming the dough into bunnies anywhere? Baked rolls can be frozen. I haven't tried freezing the dough and then thawing and letting it rise (like Rhodes roll). The number of bunnies you get will depend on how big you make the bunnies, but if you use the sizes I recommend you should get about a dozen bunnies. 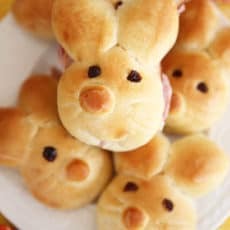 I want to make these cute bunny rolls today for Easter but when you say 1 package of active dry yeast does that mean 3 packets or just 1? Cori, I meant 1 packet (not three). Carefully cut away 1 packet from strip the three packages. LOOKS GREAT -GO VEGAN !! Too cute! Will the dough be ok if I shape the bunnies the same day I make the dough and leave them in the fridge for a couple of days until I need to bake them? Sandra, I think that will be okay, just remove from the refrigerator and allow to rise a bit before baking. So cute. Great directions - so doable, Will try this For Easter. These are so cute!! I would love to have you share at my link party, Sharing Saturday. This week's just opened up. Those are so cute and look easy to make. Pinning this for Easter. May I ask what that green bean and mushroom side dish is? It looks delicious. Oh My Gosh - So cute Cindy! !